I was nineteen when I saw my first city rat. At the tail end of my freshman year, a late night of studying found me at the local Starbucks to grab something, anything, to keep me awake. The concrete was glistening with light reflecting off of the puddles from a fresh rain, and I expected the smell of after-rain and earthworms to fill the air. Instead, it was thick with a concoction of car exhaust and the distinct breath of Burger King french fries. On my walk back to the dorm, an unmistakable figure revealed itself in the street. A skinny tail trailed from a plump, fuzzy mess of fur, and as soon as he appeared, he was gone, hidden by bushes in a concrete garden. This rat knew exactly where he was going and how to get there using the least conspicuous route, flawlessly thriving in the place he knew as home, no different from the hurried congregations of students and professionals who filled the streets by day. Coming from Michigan suburbia, the animals who lived around me did not coexist with us but rather in spite of us. They found their dwellings in the plenty of green space around, yet the human disruption and habitat fragmentation lead to roadkill being one of the most common ground coverings. It’s hard to find someone from my area who hasn’t been in a deer-related car accident, and the normalcy of ultimately deaths was so intrinsic to our culture that I knew a kid in high school who made hats out of the dead raccoons he found on the side of the road. Driving past freshly killed wildlife is far more commonplace than encountering it breathing, and even in neighborhoods, wild animals are pests to avoid, to exterminate when they step out of line or encroach on our space, the land we forced them to relinquish. Contrastingly, in Evanston, the animals have learned to accept us into their world and agreed to adjust to the cityscape. I never thought much of the squirrels here, who seem the same as those at home, albeit less wary of humans and much more willing to jump into trash cans for a snack. Making the long walk down Sheridan, I often watch the timing of the lights to gauge if I’ll approach the crosswalk during a walk or wait period, and one day I observed a squirrel wait patiently on the curb as cars zoomed by. Only once the light changed and the crowd of people began to transfer sides did the squirrel follow suit, as if he knew there was a cue for safety. Squirrels in Michigan don’t wait; they run blindly in hope that nothing will happen to them if they run under your tires. As an avid believer in non-human animal intelligence and wanting more data on the topic to compare to the critters back home, I took to squirrel-watching at crosswalks. Sure enough, the phenomenon happened time and time again; the squirrels learned patience to survive. Many other animals have stolen my heart in Evanston. On my way to class, I often talk to the local bunnies who are busy munching, and I’m this close to getting them to think of me as a friend, too. Some are more secretive and avoidant, but their whimsy enchants me nonetheless . As a freshman, I heard whispers--once in the library--of a fox who resides in Deering Meadow. Born out of seeing a fox once in my preschool playground eating dandelions, my fascination with wild foxes runs deep and central to my love for animals. For many years, that pre-k fox was the only wild one I saw, so the thought of seeing the fox around campus haunted me with wonder anytime I was out at night. One lucky walk home under the stars, I searched the darkness of Deering for a sign of life, and she met my eyes standing solidarily in the middle of the meadow, ears perked towards me and eyes alertly watching me in confidence and curiosity. In those abandoned hours, this fox was free to be inquisitive of the very few people out, and Evanston transformed to a familiar, wild, damp haven for her. The second time I had the pleasure, she ran along the paved paths of campus early in the evening, palpably anxious realizing that she had come out too early, that the cars and drunk laughing of humans ruled the streets instead of her. She was just feet from me, sprinting, stopping and glancing around warily, sprinting backwards and then forwards. She was an orange ghost in a world that did not belong to her. Across the world, rapid urbanization has prompted animals to assimilate into city life alongside humans as plenty have on our campus: just a few miles south in downtown Chicago, coyote populations are highly studied, where the tracking data allowed researchers to monitor a mother coyote raise five healthy pups in the parking lot of Soldier Field; Los Angeles houses cougars among the housewives and celebrities; in London, England, peregrine falcons have used the city as a sanctuary to bolster their dwindling populations since the 1980s; and Mumbai, India regularly has leopards roaming the streets that help to control rabies caused by feral dog bites. Hypnotized by these stories and my experience with urbanite fauna, I began to wonder: what makes some animals so good at making the concrete jungle their home? As it turns out, there is some science to support that urban animals are more intelligent than their backwoods, hippie counterparts. 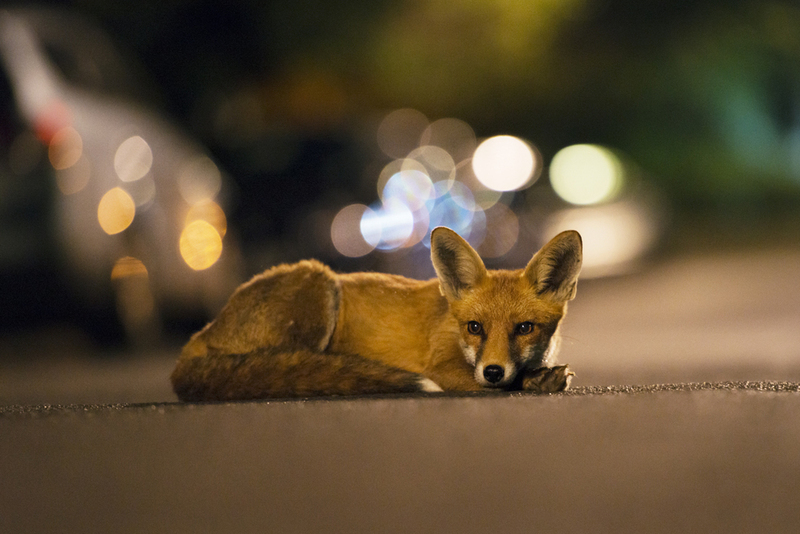 Animal ecologists have observed higher rates of problem solving and favorable behaviors that enable numerous and varied animals who live within cities to exist and thrive. For example, some research reveals that urban birds are superior at problem solving and have bolder personalities, and metropolitan raccoons have shown the same trend. While a study has found that city-dwelling mammals actually have bigger brains and a muted stress responses compared to those living in rural areas, urban ecologists and animal behaviorists agree that social learning is the main cause behind synurbanized--a term used to describe wildlife that adapts to live in urban environments--zoological wit. The term behavioral plasticity is used to explain how animals have undergone cultural evolution to promptly learn how to survive among the two-legged anthropocentrists, and it can help us understand how it appears city-specific traits and personalities have been selected for in animal populations. Through watching others of their kind fail to survive among humans, animals have come to teach one another what behaviors this new habitat requires of them, so it’s very possible my squirrels know exactly what they’re doing when they wait to cross the road. Moreover, convincing evidence shows that across the globe, animals are becoming more and more nocturnal to avoid people, which explains my encounters with the ever-elusive fox. Yearning for nature wherever I can find it, I often think of the animals of Evanston as the friendliest neighbors and allies. For a long time, I viewed them sympathetically, pondering what better lives they would have in an untouched-by-man wilderness, and a large part of me still mourns for the wildness they lost by inhabiting a human-filled town. Perhaps, though, I should allow the resilience they show to bewilder me, their intelligence to humble me, and their ability to coexist inspire me. This town, this world, remains theirs and ours the same.